A couple of weeks ago my neighbor had a garage sale and I was pretty stoked when I arrived home from a visit with my Mom to see this Baker's Rack sitting on their driveway. My heart was already a flutter being a beautiful sunny Friday afternoon but when I set eyes on this baby, I got the goosies! I know all you thrifters can relate. I didn't need to look twice before shouting SOLD. I picked up an awesome desk too but more about that in another post. Other than a few little knicks it was in pretty darn good shape! I loved the black frame and didn't want to alter the color but the wood kept screaming "red". 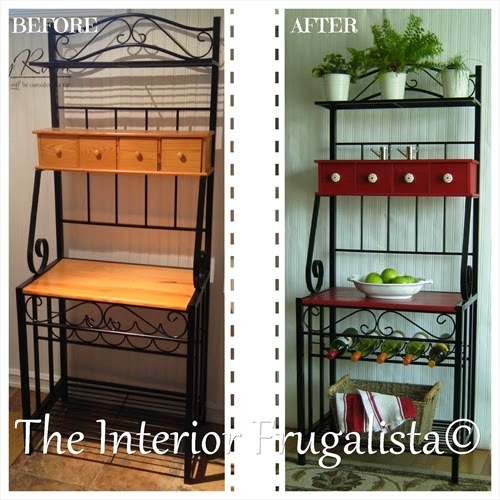 When I think red I go to my all time favorite, Emperor's Silk Annie Sloan Chalk Paint™. Add some dark wax and the color becomes so rich and deep - I just love it! Always wanting to inject some personality into my pieces I found these gorgeous handpainted knobs at Lee Valley Tools. Perfect for a baker's rack don't you think? Aren't these watering can salt & pepper shakers adorable? I picked them up at a quaint little shop called Backstreet Gifts & Antiques at The Village at Pigeon Lake when Mr. Frugalista and I were celebrating our 27th wedding anniversary in March. I love that it has a wine rack on the bottom. 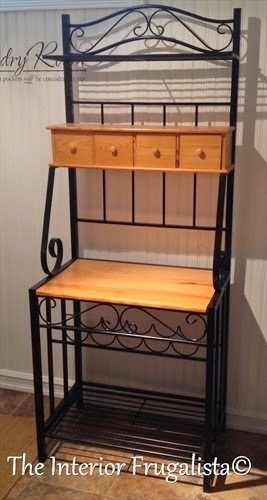 I'm thinking a cute boxwood wreath or a chalkboard with a chippy white frame would look gorgeous hanging from the rails in the middle of this rack. I wish I had room in my kitchen for this beauty but sadly I don't. Like most of the pieces I grow to love during their makeovers, I have to part with this one. It'll be added to my Etsy Shop soon.